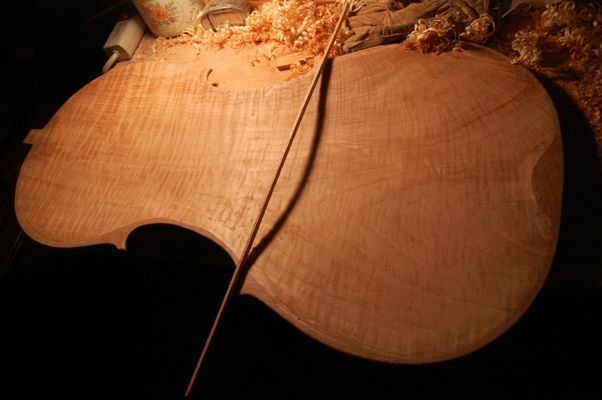 The Inside carving (Graduation)on the one-piece Cello back is complete. The scrap of lining material is only there to cast a shadow so you can see the curves. Again, you can’t see it very well, but I also rounded the edges, beginning the edge-work that is so important to the finished product. I do the inner edge first, as it is hard to access once the plate is installed. I began with a tiny plane, and cut a narrow bevel all the way around the edge, at a 45 degree angle. Then I used a file and a scraper to round it into what is essentially a quarter-circle curve. This plate is ready for installation. 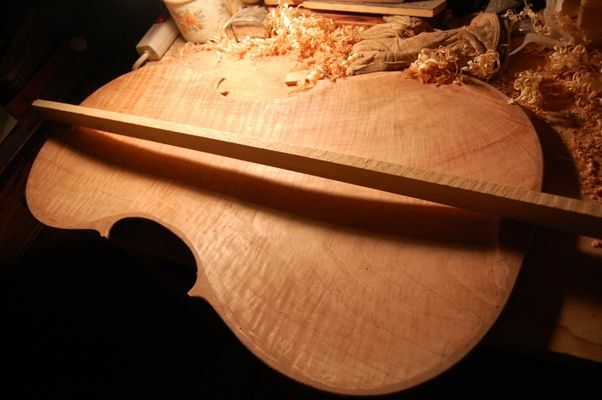 I will try to close the corpus this week, and then scramble to complete the neck and scroll.